Objective personality test to assess impulsiveness / reflexivity as well as aspiration level, performance motivation and frustration tolerance.. Attitude towards work is an objective test battery to assess various personality dimensions by presenting simple tasks. Main areas of application: personality-based aptitude diagnostics, industrial and organizational psychology, consulting regarding school, college and career decisions, and sports psychology. The test battery "Attitude towards Work" provides objective tests following R.B. Cattell, which examine the cognitive aspect Impulsivity / Reflexivity as well as the motivational psychological constructs Aspiration level, Performance motivation and Frustration tolerance. The assessment of performance motivation follows the approaches by McClelland and Atkinson. The first subtest "Comparing surfaces" assesses impulsiveness / reflexivity. 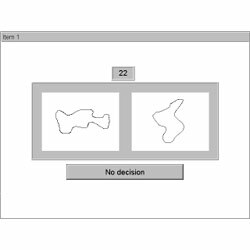 The respondent may chose among three possible answers (right / left / no decision) for deciding about which one of two simultaneously presented surfaces is larger. The second subtest "Coding symbols" assesses the aspiration level and the frustration tolerance of the respondents. They are to assign symbols to abstract shapes according to a pre-set code, and then they are asked to estimate their performance in the next task. In addition, they receive feedback messages. The third subtest "Differentiating figures" assesses performance motivation. The respondent is asked to indicate which one out of various symbols does not belong. There is one test form. Three characteristic values are calculated in the subtest "Comparing surfaces": "Exactitude", "Decisiveness", and "Impulsiveness / Reflexivity". The subtest "Coding symbols" provides the characteristic values "Performance level", "Aspiration level", "Frustration tolerance", "Time of maximum performance", and "Target discrepancy". The last subtest "Differentiating figures" calculates the characteristic value "Performance motivation". The specification of a standardized assessment error seems not to be reasonable for the test Attitude towards Work. Due to the theoretically based derivation of the characteristic values, a content validity can be assumed. Ebenhöh (1994), Kubinger (1995) and Frebort (2003) showed that individual characteristic values differentiated significantly between successful and less successful co-workers or trainees. Corresponding to the theory, different characteristic values in the two studies proved to be advantageous. Moreover, Kubinger & Hofmann (1998) showed in a factor-analytical study that "Impulsiveness / Reflexivity" correlates with extroversion, whereas "Frustration tolerance" correlates with conscientiousness. "Performance motivation" on the other hand seems to be a factor on its own and is not covered by the "Big Five". Wagner-Menghin (2003) reports on the results of a study about the identification of three types of motivation. A representative norm sample (n=326) is available. Furthermore, an evaluation sample (n=314) is also available which mainly encompasses students and employees and is thus not representative. In addition, there is a sample of job applicants of the enterprise NOKIA (n=498). Percentile ranks and T-scores are indicated, excluding for the moment of peak performance. Various studies proved the test to be resistant against manipulation (e.g. Kubinger, 1995; Hofman & Kubinger, 2001; Benesch, 2003; Greifes, 2003). The administration time of the subtests "Comparing surfaces" and "Coding symbols" amounts to about 15 minutes altogether. Note that the subtest "Differentiating figures" will usually take at least 20 minutes (45 minutes maximum). Objective test battery to assess various personality dimensions by presenting simple tasks.